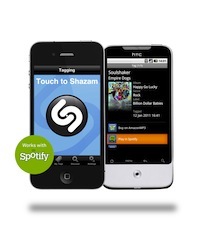 The excellent music finding service Shazam and the brilliant music listening service Spotify have joined forces in an update to the Shazam premium apps on iPhone and Android. As long as you have both apps installed, when you find a track using Shazam you can tap the “Play in Spotify” button, and it will launch the track in Spotify for you to listen to, as well as letting you explore more music from the artist. At the moment this is only available on the Shazam Premium app, it will shortly be coming to the free app as well. This is a really excellent demonstration of what modern mobile technology can do – hear a track you like while you are out and about, press a couple of buttons and you can be listening to it in your playlist in seconds.